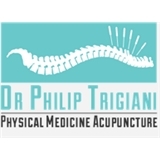 Dr. Philip Trigiani Physical Medicine Acupuncture (New York) - Book Appointment Online! An alternative and complementary "non-therapy", offering not only new dimensions in mere relief, but a process of self-discovery, self correction, and self healing. Physical Medicine Acupuncture (PMA), is a system of body-mind integration developed by master orthopedic acupuncturist, pain management specialist, and soft tissue expert Dr. Philip Trigiani, designed to provide comfort, enhance body function and raise awareness, and it works every single time! The fundamental of this clinic is to see how little we can do, in how few places, and how quickly it can be done. This is to accomplish the greatest amount of change in the shortest amount of time, with the least amount of cost. The team welcome you so awesomely. Then you meet Philip and he is great. He's very honest, warm, and genuine. Highly recommend him!